The Soyuz TMA-17M launched from the Baikonur Cosmodrome in Kazakhstan to the International Space Station at 5:02 p.m. EDT (3:02 a.m. on July 23 Baikonur time). Kjell Lindgren of NASA, Oleg Kononenko of the Russian Federal Space Agency (Roscosmos) and Kimiya Yui of the Japan Aerospace Exploration Agency (JAXA) now are safely in orbit. Lindgren, Kononenko and Yui will dock with the station’s Rassvet module at 10:46 p.m. NASA Television coverage of the docking will begin at 10 p.m. Welcoming them aboard will be the current station residents, Expedition 44 Commander Gennady Padalka of Roscosmos, as well as Flight Engineers Scott Kelly of NASA and Mikhail Kornienko of Roscosmos. NASA TV coverage of the hatch opening and welcome ceremony begins at 11:45 p.m.
Padalka, Kelly and Kornienko arrived at the space station in March aboard their Soyuz TMA-16M spacecraft. Some of the cargo flown aboard the Soyuz will be used in research investigations that are either ongoing or planned aboard the International Space Station. Items such as questionnaires will be delivered to obtain data about crew member characteristics, such as day-to-day changes in health or incidence of pain or pressure in microgravity. One such investigation is Space Headaches which uses questionnaires to collect information about the prevalence and characteristics of crew members’ headaches in microgravity. This information is used to develop future countermeasures for headaches often caused by intracranial pressure change. In addition to these studies, seven categories of human health research are ongoing during the One-Year mission of Scott Kelly and Mikhail Kornienko. Researchers expect these investigations to yield beneficial knowledge on the medical, psychological and biomedical challenges faced by astronauts during long-duration spaceflight. Read more about all of the One-Year Mission human health studies. 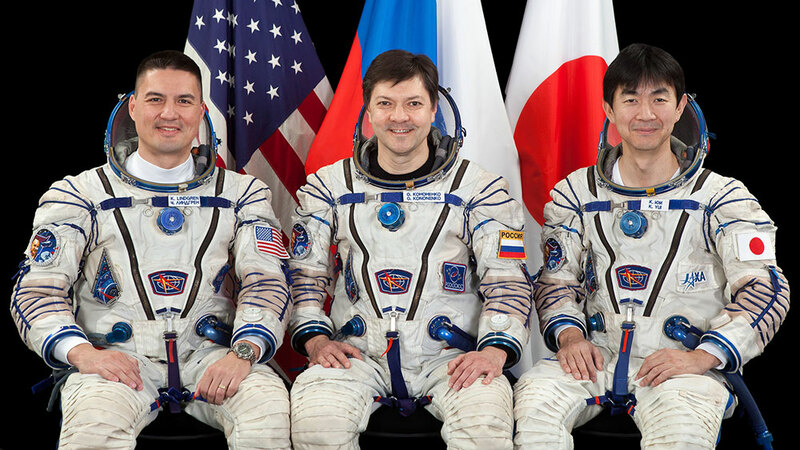 JSC2015E053687 (04/30/2015) — Expedition 44 crew members NASA astronaut Kjell Lindgren (left), Russian cosmonaut Oleg Kononenko (center) and Japan Aerospace Exploration Agency (JAXA) astronaut Kimiya Yui. The Russian Soyuz spacecraft that will carry three additional crew members to the International Space Station stands ready for its 5:02 p.m. EDT liftoff. NASA Television coverage of the launch begins at 4 p.m. Watch on NASA TV or at: https://www.nasa.gov/nasatv. 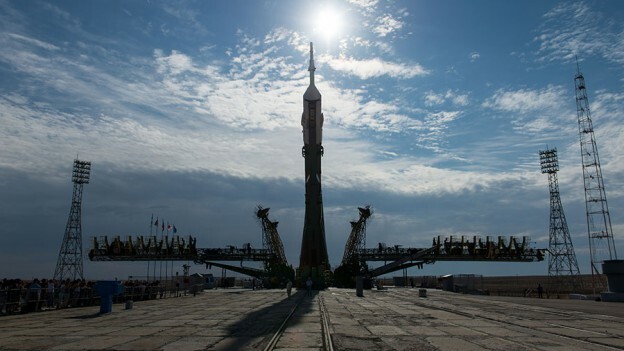 Kjell Lindgren of NASA, Oleg Kononenko of the Russian Federal Space Agency (Roscosmos) and Kimiya Yui of the Japan Aerospace Exploration Agency (JAXA), will launch aboard their Soyuz TMA-17M spacecraft from the Baikonur Cosmodrome in Kazakhstan. 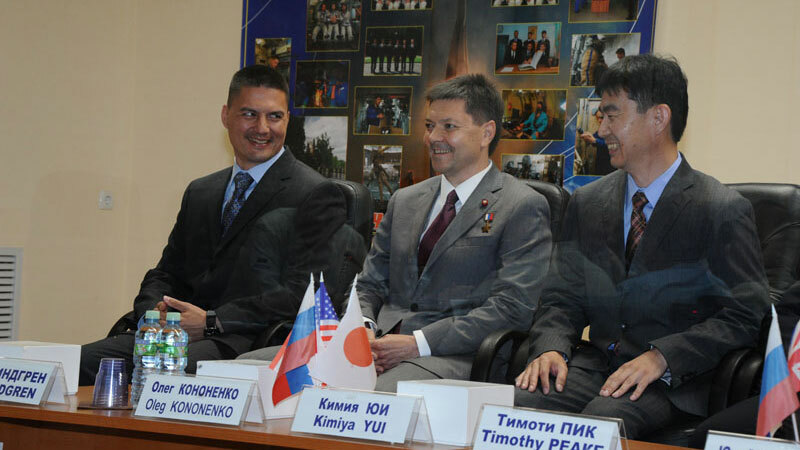 (From left) Expedition 44 crew members Kjell Lindgren, Oleg Kononenko and Kimiya Yui announce their mission readiness at the State Commission at the Baikonur Cosmodrome in Kazakhstan. Three new International Space Station crew members are making final preparations a day before their launch to the orbital laboratory. 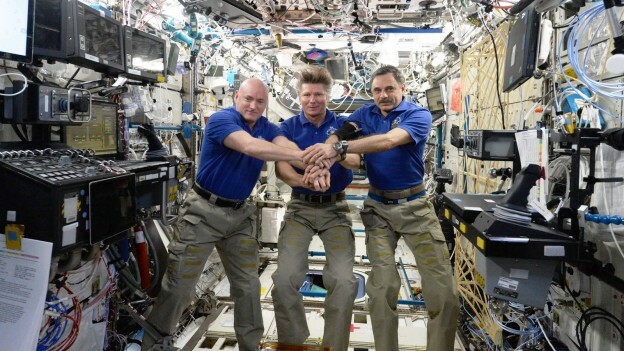 They will join the orbiting Expedition 44 trio which is busy today with a variety of advanced microgravity experiments to benefit life on Earth and future space crews. An international crew from Russia, Japan and the United States is in Kazakhstan as their Soyuz TMA-17M spacecraft rests on its launch pad counting down to a 5:02 p.m. EDT launch on Wednesday (3:02 a.m. Baikonur time Thursday). Soyuz Commander Oleg Kononenko, Japanese astronaut Kimiya Yui and NASA astronaut Kjell Lindgren will take a six-hour ride to the space station and dock to the Rassvet mini-research module. They will stay on orbit until December. Waiting for their new crewmates are One-Year crew members Scott Kelly and Mikhail Kornienko and Expedition 44 Commander Gennady Padalka. Kelly was assisted early Tuesday by Padalka as he conducted ultrasound scans on his leg for the Sprint exercise study. Kelly later watered plants for the Veg-01 botany study then worked on the MERLIN science freezer/incubator. Padalka worked on Progress resupply ship cargo transfers and inventory updates. Kornienko studied cell cultivation for the Kaskad biology study before moving on to radiation research for the Matryeshka-R BUBBLE experiment. The Expedition 44 crew is back at work after taking precautions as a piece of orbital debris safely passed the International Space Station this morning. Meanwhile, three new crew members are conducting final preparations before next week’s launch to the orbital laboratory. Mission Control in Houston tracked a fragment of an old weather satellite and predicted a possible conjunction with the station at 8:01 a.m. EDT. Flight Director Ed Van Cise then ordered Commander Gennady Padalka and One-Year crew members Scott Kelly and Mikhail Kornienko to take shelter in their docked Soyuz TMA-16M spacecraft as a precaution. After a safe pass, the crew then went back to work resuming normal station operations. 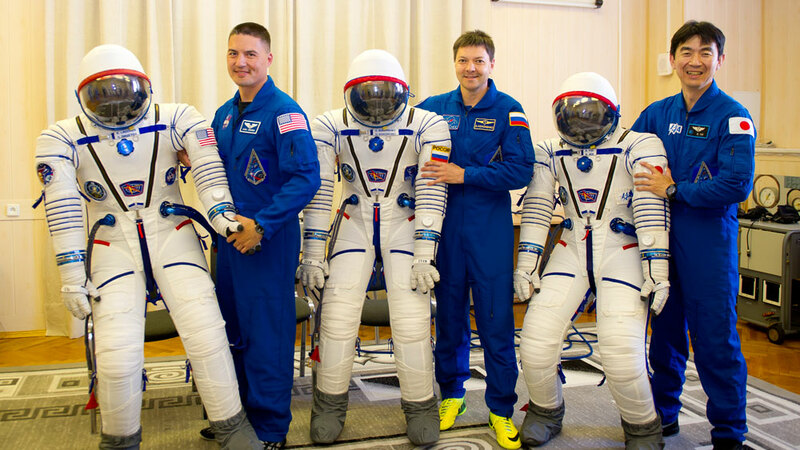 Back on Earth, three new Expedition 44 crew members from the U.S., Russia and Japan are counting down to their July 22 launch aboard the Soyuz TMA-17M spacecraft. The trio consisting of Soyuz Commander Oleg Kononenko and Flight Engineers Kjell Lindgren and Kimiya Yui are at the Baikonur Cosmodrome in Kazakhstan for final prelaunch activities while engineers inspect their Soyuz vehicle before next week’s roll out to the launch pad. The International Space Station is featured in this image photographed by an STS-132 crew member on space shuttle Atlantis. The crew of the International Space Station is resuming normal operations after getting an all clear from Mission Control following a close pass by space debris this morning at 7:01 a.m. CDT. All station systems are operating normally and the crew will move out of the Soyuz spacecraft in which they stayed during the debris pass. They will reconfigure the station for normal operations and then continue their research work during the day. This was the fourth time in the history of station operations that the crew has moved to the Soyuz due to a potential close pass of debris. This debris was from an old Russian weather satellite. The International Space Station was photographed by an STS-132 crew member on space shuttle Atlantis. The crew of the International Space Station has moved into the Soyuz vehicle docked to the station as a precaution due to an anticipated close approach of a piece of space debris to the orbiting complex. The debris is expected to pass closest to the station at about 7:01 a.m. CDT July 16, 2015. 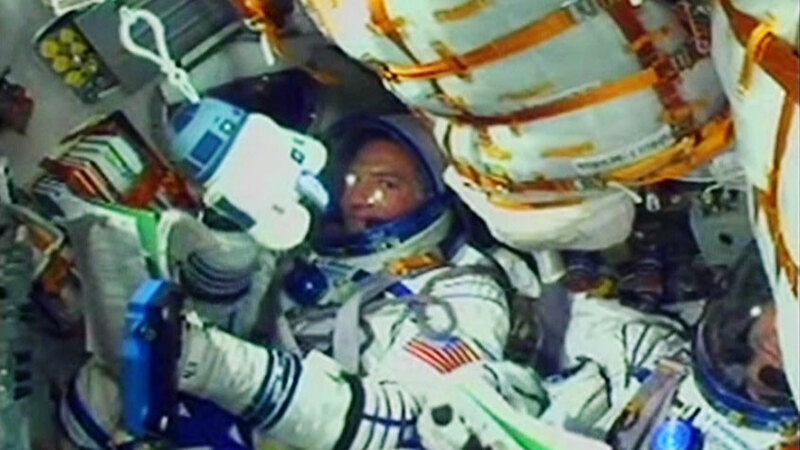 The crew will remain in the Soyuz until given an all clear by Mission Control. All station systems are currently operating normally. NASA TV will broadcast station operations live beginning at 6:45 a.m. CDT and continuing through resolution of this event. Watch NASA TV now. The three Expedition 44 crew members commemorated today the July 15, 1975, launch of the Apollo and Soyuz spaceships that would dock two days later. The day before, the crew celebrated the successful Pluto flyby of the New Horizons spacecraft. Then it was back to work as the station residents continued space research and orbital maintenance inside the International Space Station. One-Year crew member Scott Kelly explored the benefits of shorter, more impactful exercise routines for the Sprint study then tended to plants being grown for the VEG-01 experiment. 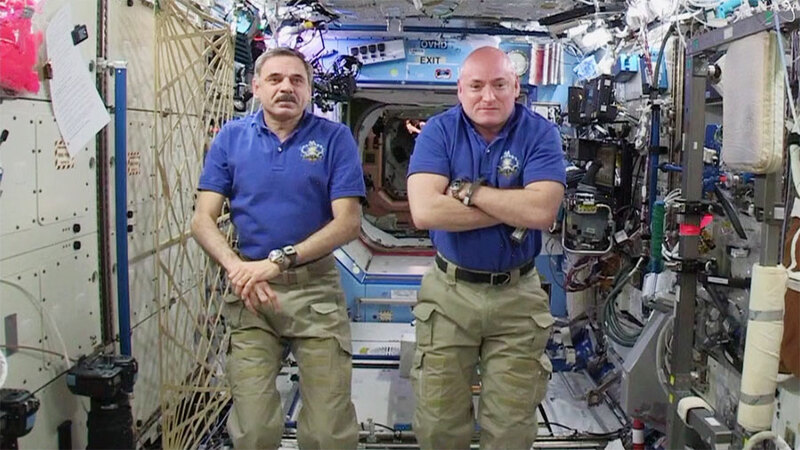 Commander Gennady Padalka and One-Year crew member Mikhail Kornienko started their day on electronics work. Kornienko then moved on to cargo transfers and inventory updates before working on the Vizir photography study exploring new Earth observation techniques. Padalka wrapped up his day with more Russian maintenance. In Kazakhstan, three new Expedition 44 crew members are counting down to their July 22 launch to the station inside the Soyuz TMA-17M spacecraft. 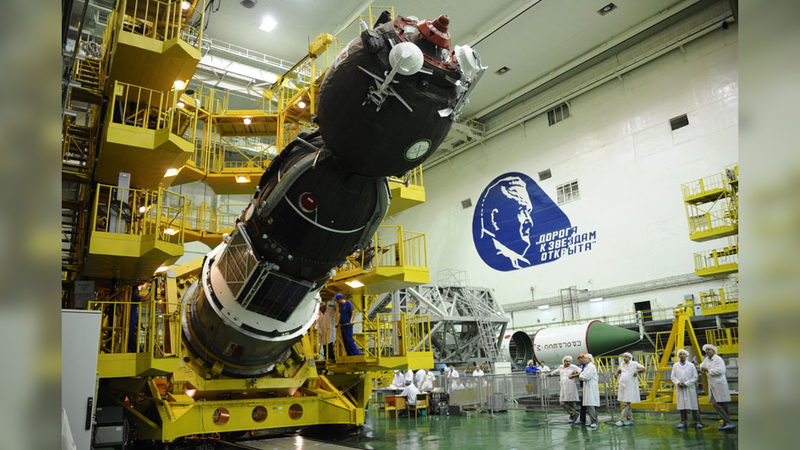 At the Baikonur Cosmodrome engineers are inspecting the Soyuz spacecraft before its roll out to the launch pad next week. Astronaut Scott Kelly recognizes the Pluto flyby of the New Horizons spacecraft. As the Expedition 44 crew orbited above the Earth at 17,500 miles per hour the New Horizons spacecraft flew by Pluto this morning at more than 30,000 mph. New Horizons’ closest approach was about 7,750 miles above the dwarf planet’s surface after a nine-year trip. The International Space Station has been orbiting at an average altitude of about 250 miles since November 1998. 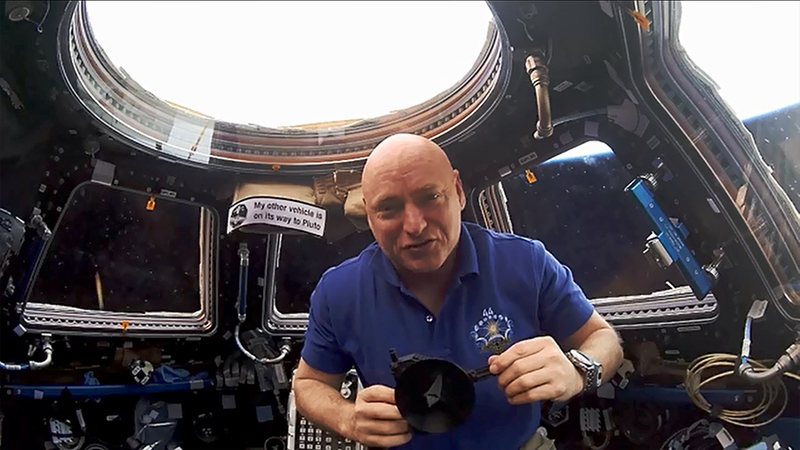 Watch the video as NASA astronaut Scott Kelly recognizes the historical accomplishment. Kelly talked to the Weather Channel and CNN International about his One-Year mission and today’s Pluto flyby. Kelly also checked out life support systems and deployed radiation detectors inside the station for the Radi-N experiment. The two cosmonauts, Commander Gennady Padalka and One-Year crew member Mikhail Kornienko, worked on a variety of Russian science experiments Tuesday. 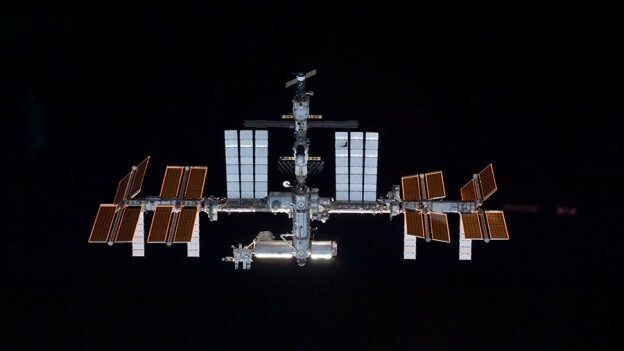 The duo explored cell cultivation, radiation exposure, crew performance measures and vibrations the space station experiences during internal and external operations. Another crew is in Kazakhstan counting down to their July 22 launch on the Soyuz TMA-17M spacecraft to join Expedition 44. First time flyers NASA astronaut Kjell Lindgren and JAXA astronaut Kimiya Yui will join Soyuz Commander and veteran cosmonaut Oleg Kononenko for the six-hour ride to their new home in space.